Whoever said that youth is wasted on the young was correct. I had the opportunity, in my youth, to witness many amazing moments with horses and people in horsemanship history, as I went glibly along my merry way not comprehending what I’d experienced. The farm had been considered the most beautiful farm in the world. I was skeptical. After all, this was Kansas City, Missouri; the heart of the stockyards and a cow town. As we drove toward Longview Farm we went past what seemed like an endless amount of white board fence. It was an unusual site for this part of the country and you could tell it had been there for awhile by it’s “worn and in need of paint” appearance. Later I learned that the fence had been built with out nails and that cyprus had been chosen because it was a wood that would last without rot almost forever. There were almost 30 miles of beautiful white washed fence on the farm. My recollections about that particular visit to Longview Farm farm visit are a little bit dim and intermingled with later visits but I recall the feeling of entering another time and place. I remember going to an amazing horse barn that had a huge round indoor arena, the largest of its kind in its day. One side of the barn stored beautiful carriages and the other had about 30 horse stalls. I remember that the concrete aisle was lined with woven grass matts to make sure the horses didn’t slip. And there was an old tack trunk that still held a blue wool cooler, reminiscent of another time. The caretakers lived in an apartment in the beautiful horse barn and they were happy to talk with us at length. Being a Kansas City resident, Rick already knew a bit about Lula Long Combs. She was a legend in Kansas City and had long been dubbed the Queen of the American Royal. The care takers showed us where her favorite horse, Revelation, was buried and told us that the farm was still home to a few old retired horses. They gave us permission to visit the buildings and wander through the pastures. told him that she gave all of her horses names ending in “ion” because champion ended in “ion”. We explored the enormous work horse barns with huge stalls and a system for feeding hay from the loft. Longview Farm, which had been built circa 1914, was a self sustaining farm with crops, farm animals, orchards, and a huge greenhouse that produced roses. Longview also had it’s own natural gas supply, a security system and telephone system. It provided all of the food for everyone who lived there. The farm had more than 40 buildings on it ranging from the Longview mansion with its 48 rooms and 6 fireplaces, to homes for workers, a small church, work horse barns, animal confinements and the beautiful indoor arena show horse barn. Longview Farm also was the first electrically lit “city” of it’s day with about 7 miles of roads that were lit. you could easily picture how the people were dressed and socializing on one of Lula’s exhibition days. 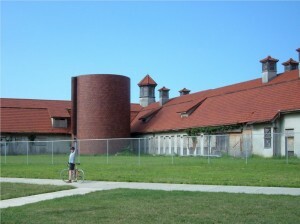 I understand that today the race track grandstands have been removed from the farm while many of the other buildings have been preserved, restored and placed on the historic register. The last time I visited Longview it was the site of a brand new eventing course and the buildings were being used commercially. But what about Lula Long Combs? It’s easy to believe that her father R.A. Long built most of Longview with Lula in mind. Lula began to show horses as a teenager in Kansas City. When she was well into her 80s, Lula still made appearances at the American Royal driving one of her fine carriages and wearing her beautiful signature hat with plumes and feathers. 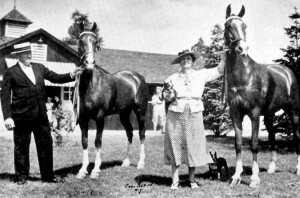 Lula Long Combs was still the undisputed Queen of the American Royal. In 1911 the Long family made a trip to England so that Lula’ horse, The King, could be shown at Olympia. Her trainer was supposed to drive him but some other trainers took him out for “a night on the town” the night before leaving only Lula able to drive the very strong horse, which she did winning the blue at Olympia. In 1912 Lula bough a cowpony in Colorado that she named Speculation. She raced him against the cowboys on the Colorado ranch and beat them. In her earlier years she also rode her father’s jumpers over 5’ jumps. Lula did not lack nerve or skill when it came to horses, whether it was riding or driving. Lula showed horses across the United States and Canada, including Madison Square Garden in New York where she was put in to Madison Square Garden’s Equestrian Sports Hall Of Fame. Her name is listed along with Maj. Gen. Guy V. Henry, former chief of Cavalry, U. S. Army. she trotted her horse wide open and the crowds went wild, cheering for her. She was a skilled horsewoman who let her horses shine in the arena and had an impeccable turn out. She usually wore a different outfit for each class and she believed that her big hats added to the movement of the carriage. She was such a sensation after her first year at Madison Square Garden (1913) that a representative from Ringling Brothers came to ask her if she’d join the circus, and the Waldorf Astoria in NY named a drink after her. And rumor says that she had two fingers in a splint at the time of her performances! 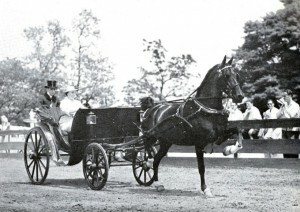 In Rhode Island Lula Long showed her mares in pairs driving and in 1914, she broke the world’s record for heavy harness half-mile race for tandems at the Springfield, Ohio show with Aviation and Affection. memoirs and titled them “My Revelation”. Lula Long Combs was a remarkable horsewoman who was ahead of her time with her skill and verve in the show ring. She was also “right” for her time because she added excitement to the sport, loved her horses and exemplified the epitome of sportsmanship. She died in 1971. Fabulous. I too got to visit the amazing place several months before she died. The barn caretaker showed me all the carriages, trophies, exquisite tong in groove lumber that was used. He was so proud and it was a magical experience for me as I fell in love with horses and animals when I was 2 and have been riding since then as a owner and trainer. I am at 80 still lucky enough to ride my horses daily. Thank you for this additional information and especially the photo of the barn which I couldn’t find elsewhere. She was truly an wonderful lady. Thank you for your comment. She was a model for young equestrians. Such a wonderful history. And you are fortunate to have visited when you did. I enjoyed everything you wrote about Mrs. Combs. I just wanted to add that the electricity was produced by the farm’s own hydro electric dam at the lake. The place was truly amazing and, at the time that it was buil,t it was cutting edge modern. And hi Beverly Birnbaum, Truly one of the most committed horse women I have ever met! Thank you so much for the link to these pictures. They are well worth an afternoon’s study.